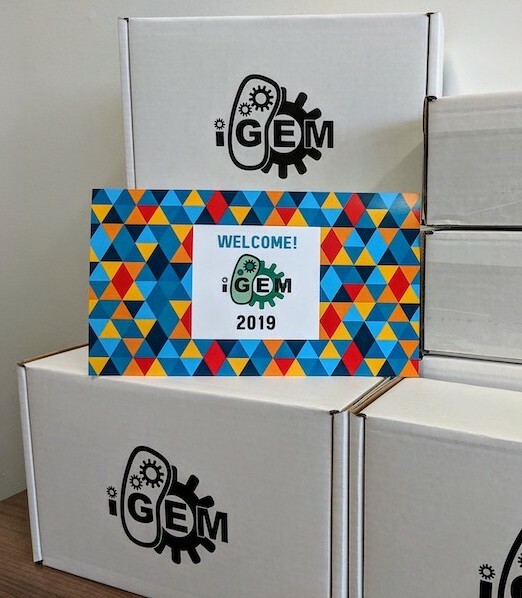 Whether you’re new to iGEM and the Registry of Standard Biological Parts or an experienced participant, make sure to read through the Distribution Handbook. The iGEM 2019 DNA Distribution contains over 2000 high-quality part samples as dried plasmid DNA. 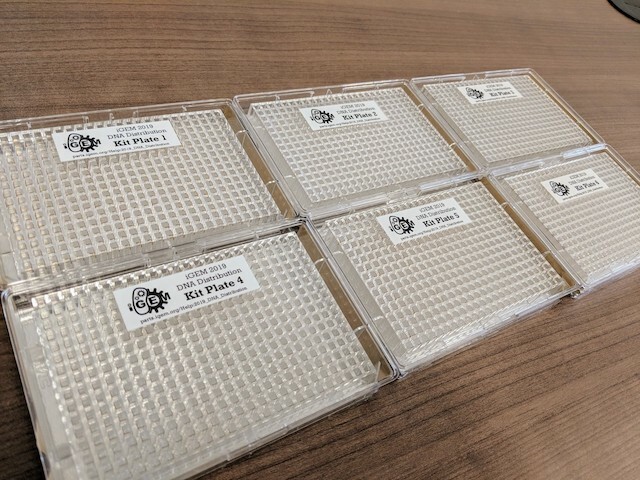 Each sample is QC tested through sequencing and AB test plates. While there is not enough DNA for assembly right out of the kit, you can transform a part into competent cells and make your own glycerol stock for future use. When you receive your Distribution Kit, let us know through Twitter (#WelcomeToiGEM)! If you're new to the Registry, iGEM, or synthetic biology, you will also want to read through our Help pages before you get started. Where's my Sample Submission Kit? Please keep kit components out of direct sunlight for long term storage, and follow individualized temperature storage requirements below. While Kit plates and components may continue to work for years, iGEM and the Registry only supports kits for one year. Freeze Indicator included in the Distribution Kits: If your kit was frozen at some point, the indicator bead turns purple. DNA Distribution Kit Plates: Store at room temperature. When a well is resuspended, store plate at -20°C, or store resuspension separately at -20°C. Note: If you received your kit, and the freeze indicator was purple (instead of clear), then your kit was frozen at some point during shipment. Your Measurement Kit (the silica beads specifically) is no longer usable, but you can request a new one from us. The distribution only contains parts with samples that are sequence confirmed or ends confirmed (long parts > 1600bp). This has ensured a high quality distribution, in which all parts have a sequence result of Confirmed, Partially Confirmed/Single Error or Long Part. All users should review the sequence results of a part sample before using it. Note: We're still in the process of curating the Distribution, and removing samples that did not meet our requirements! The majority of part samples in the in the Distribution Kit are in pSB1C3, the Registry’s standard shipping plasmid backbone. Storage: The distribution kit plates are comprised of dried DNA with cresol red dye, so they are stable at room temperature. However, once the DNA is resuspended in any of the wells, we recommend either storing the kit plate with its plastic cover in a -20°C freezer, or aspirating the rest of the resuspended DNA from the well and keeping it separately in a -20°C freezer. Whether you’re purchasing competent cells or making your own in the lab, you should test their efficiency before you start transforming parts in the Distribution Kit. The Competent Cell Test Kit is a standardized way to test and calculate the efficiency of your competent cells. If you have issues with using the parts in the Distribution Kit, the first thing we’ll need to know is the efficiency of your competent cells. See the Competent Cell Test Kit page for more in-depth instructions. Storage: When resuspended, the Competent Cell Test Kit should be stored at -20°C for longer term storage. 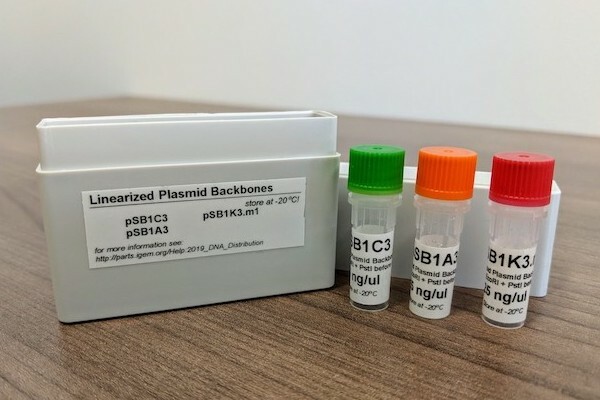 The 2019 Distribution Kit includes a set of linearized plasmid backbones: pSB1A3, pSB1K3.m1, and pSB1C3. These plasmid backbones have been prepared via PCR and purified. Prior to ligation the linearized backbones will need to be digested with EcoRI, PstI, and DpnI (DpnI is optional: to cut up original template DNA used to create linearized plasmid backbone), leaving two ends ready to be ligated to a BioBrick part. The Registry has phased out tetracycline but if you need pSB1T3 as linearized plasmid backbone, you can make your own or request some from the Registry. Storage: The Linearized Plasmid Backbones (pSB1C3/pSB1A3/pSB1K3: 25ng/ul at 50ul) should be stored at -20°C for longer term storage. 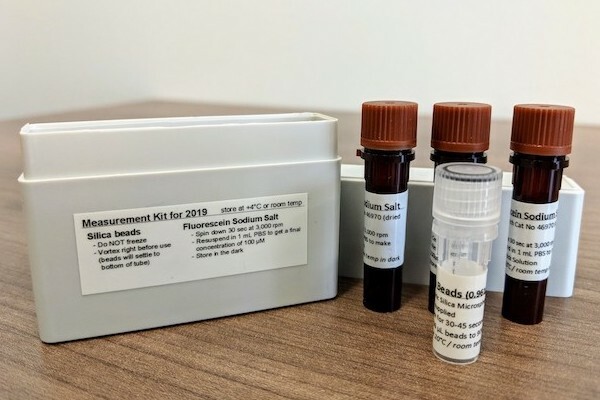 This Measurement Kit is for teams to use for their own experiments. This kit will help teams measure GFP in a plate reader. The kit includes 4 tubes (3 tubes of Fluorescein Sodium Salt, 1 tube of silica beads). Please note: there is NO InterLab activity in 2019. See the Measurement Resources page for more in-depth instructions on how to use your Measurement Kit. For 2019, teams no longer have to send samples of their parts to the Registry. This is a big change for 2019, and we encourage teams to focus on measurement, characterization, and documentation of their parts on the Registry. The information is what's important! See the Sample Submission page for more information about this change. However, if you would like to send samples of your parts to the Registry, we will accept them if they follow our submission instructions. Before using the DNA plates, you should search the Registry for useful parts, which will also tell you if we have sample in stock, its location (if they're in your 2019 Distribution), requirements, quality control, etc. You can browse the contents of the 2019 Distribution in their entirety by visiting the Repository. Click on 2019 Distribution to see the contents of all of your kit plates. Click on the 2019 Kit Plate of your choice, which will list all parts by their part name (BBa_..) in a plate along with their quality control information. Or you can click on the small part diagram below each Kit Plate link: "See a summary of the parts in this plate." We've taken care to create a very well-rounded DNA Distribution this spring, however, should you find the part, or parts, that you require are not available in the 2019 DNA Distribution but are available elsewhere in the Registry's Repository, send us an email (hq [AT] igem [DOT] org) in order to request a sample. Include the part name, the plasmid it's located in, the source, and the quality control information, and we'll send it out to you. For more information please see the Requesting Parts page. Here at Registry, we want everyone to take a look at the results of the quality control measures we've taken this year and previous years, in order to make an informed decision when choosing to use a part. We've made sure to update the online repository for the Spring 2019 distribution with our quality control results. The best way to use our quality control information is to use it on a part by part basis. As you design your project, make sure to check every part that you're interested in for its QC data. After searching for a part in the Registry and arriving at its main page, click on the Get This Part link which will take you to the section listing various quality control information for samples of that part and their locations within the Registry. The foil covers on the 384-well Kit Plates can be easily punched through with a pipette tip. Unfortunately, the foil cover will also obscure both column and row markings. You can still find your part by correctly orienting the plate using the two notched corners as markers: well A1 is located at the upper left corner of the plate when the long side of the plate with the notched corners is considered the bottom. 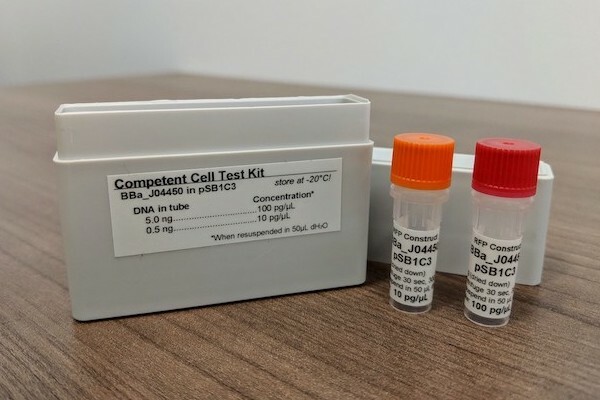 Before you use the DNA in the Distribution Kit Plates, be sure to test the efficiency of your competent cells with the Competent Cell Test Kit. Pipette 10µL of dH2O (distilled water) into the well. Pipette up and down a few times and let sit for 5 minutes to make sure the dried DNA is fully resuspended. The resuspension will be red, as the dried DNA has cresol red dye. We recommend that you do not use TE to resuspend the dried DNA. Transform 1µL of the resuspended DNA into your desired competent cells, plate your transformation with the appropriate antibiotic* and grow overnight. Note: There is not enough DNA in each well to perform anything but transformations.